Years ago, I had a friend who made the most wonderful soft, fully-chip loaded chocolate cookies. I wanted to be able to make these cookies, but she wanted to keep her recipe to herself. Finally after much coaxing, I convinced her to share her recipe, and now, I make the most wonderful chocolate chip cookies! Today, I’m going to share with you an equally valuable recipe. Many of you are writing cover letters to go with your résumés for the EMS Career Fair Reception (held next week, September 14, from 7:00 – 9:00 p.m. in the EMS Museum), and although each cover letter should be individually crafted depending on the specific audience, here is a general recipe for an effective cover letter. Sound confident, appreciative, and pleasant. Keep in mind that it’s best to follow standard business formats for professional communications (either a block or modified block letter format). It’s also best to print your letter, sign it, scan it, and then save it as a pdf if you’re sending it electronically. If you’re sending it through the mail, use high quality paper and matching envelopes. Appearance does matter. Now that I have shared with you the recipe for an effective cover letter, try your hand at mixing up a batch. 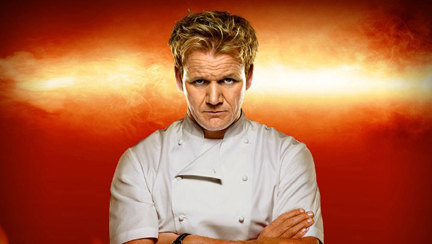 We’ll have Chef Ramsay give you a critique. This entry was posted in Professional Development and tagged cover letter, interviewing, professional development. Bookmark the permalink. Thank you for this very helpful post! I have been using your guidelines to write my cover letter. I did have one question. Is it better to write the body of the cover letter in bullet format or would you suggest using block paragraph format? I have seen cover letters both ways and read mixed opinions on the subject. What do you think?